A court shoe (British English), or pump (American English), is a shoe with a low-cut front, the vamp, and without a fastening. They are usually worn by women, but are still traditional menswear in some formal situations, where the style is sometimes called an opera slipper or patent pump. Pumps with a strap across the instep are called Mary Janes. Pumps may have an ankle strap. 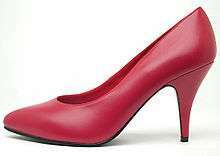 Pumps for women are usually heeled. The shape has varied through time. In the UK, in 2007, a closed toe and wide (non-stiletto) heel were worn by the very fashion-conscious, but most still wore stilettos of mainly 'kitten' height to medium height. In the UK, outside the fashion trade, the term "pumps" would normally imply flat or low-heel dancing or ballerina pumps, or even rubber-soled canvas plimsolls. In the U.S., "pumps" exclusively refers to women's shoes with a kitten or higher heel. Pumps are also part of the costume of a ballroom dancer. They are made of satin, usually tan, though other colors are made as well, and worn on both the competition and practice floors. A men's court shoe (or opera pump), in patent leather, worn with white tie or black tie attire. In the Regency period, during the day upper-class gentlemen in western Europe wore dress boots, and boots or pumps by night, which accompanied silk knee-high stockings and breeches. The shoes originally had silver cut-steel buckles, but these were removed by the influence of Brummell, and a square grosgrain bow was added. By Victorian times, evening footwear was pumps when there would be dancing or music (hence the name opera shoe or opera slipper), and patent leather dress boots otherwise. Pumps remained as standard with evening full dress until the 1930s. At that time, the dress boot was also going out of fashion, as laced shoes began to be worn at all times. Even though it now survives in much the same form as it was at the start of the 19th century (though it is occasionally now worn with plain, not patent, calf), pumps have been largely displaced by Oxfords, perhaps because of an effeminate image and the declining use of white tie. It remains acceptable (though rare) with black tie, and, since formal boots are now hardly ever worn, pumps are standard with white tie, their only remaining common use. They are still preferred with formalwear by many leaders of style. The original versions worn with steel cut buckles are still worn as part of British court uniform and dress. The construction of pumps is simple, using a whole-cut leather top with a low vamp, lined with either quilted silk or plain leather, trimmed with braid at the opening. The full leather sole is either glued onto the bottom, common on cheaper styles, or sewn, as on more costly bespoke styles still made traditionally, using a shallow slit to lift a flap of leather around the edge to recess and hide the stitching. The sole is, as on ordinary shoes, several layers of leather put together. The bow is made of grosgrain silk or rayon, in a pinched or flat form.